← In and Around “New Awlins”! 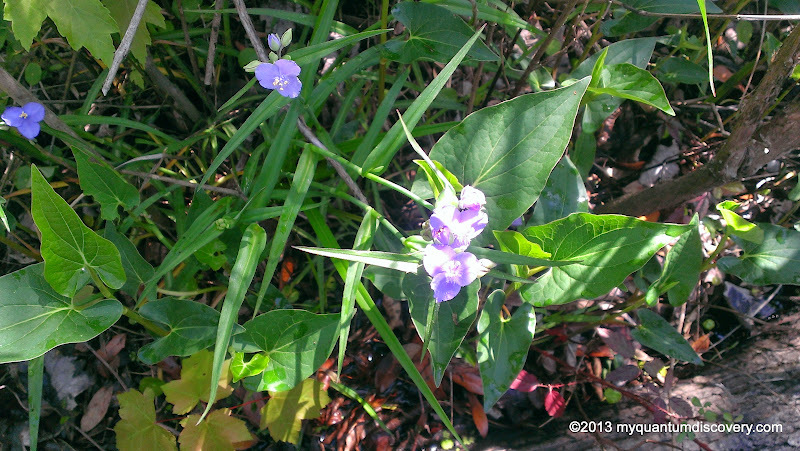 Monday, the 31st dawned with the promise of bright sunny skies and warmer temps. Not complaining but during the months that we have been in the south, we have had abnormally cool (sometimes even cold) temps. Temps in the 50’s during the day and low 40’s at night may not seem that cold compared to other regions but that’s not how it’s supposed to be here. Instead of running the AC (which we only run during the “hot” weather we had in December), most nights we would stay warm by turning on our electric fireplace. No shorts and tees, mainly jeans and sweatshirts were our everyday attire. 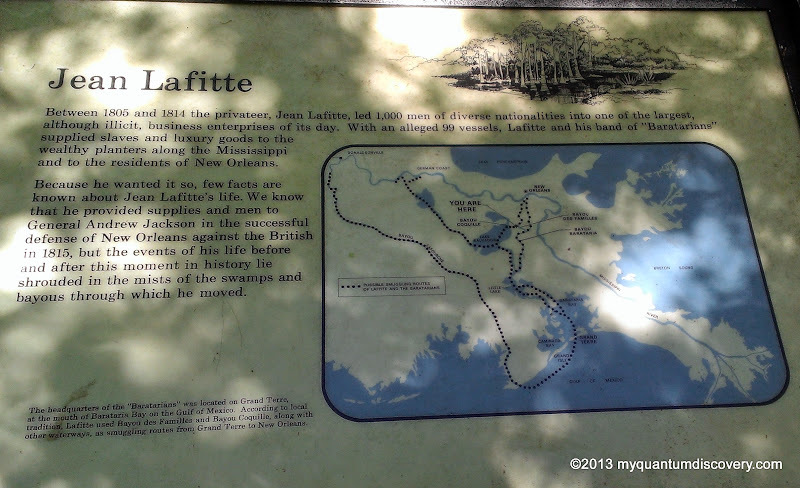 Anyway, after a quick breakfast at the hacienda (on our site at Bayou Segnett State Park campground), we headed out for the Jean Lafitte National Park. 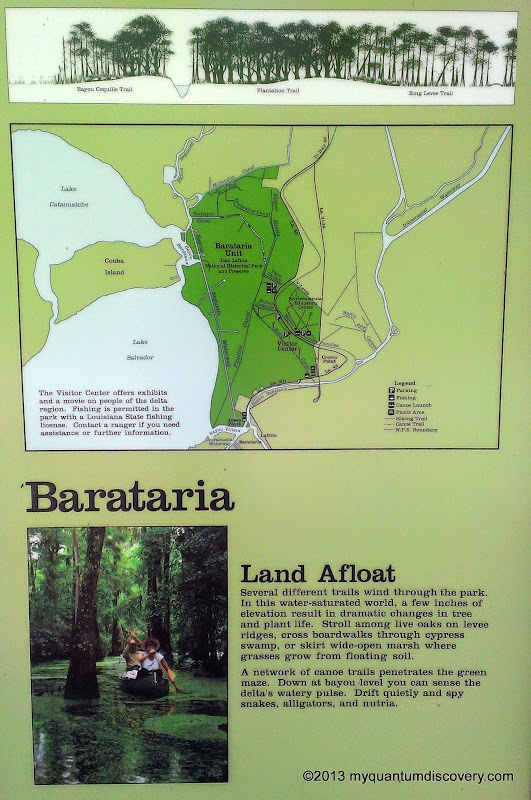 The park has six physically separate sites but our plan was to visit the Barataria Preserve, which is just a few miles south of the campground outside of Marrero. 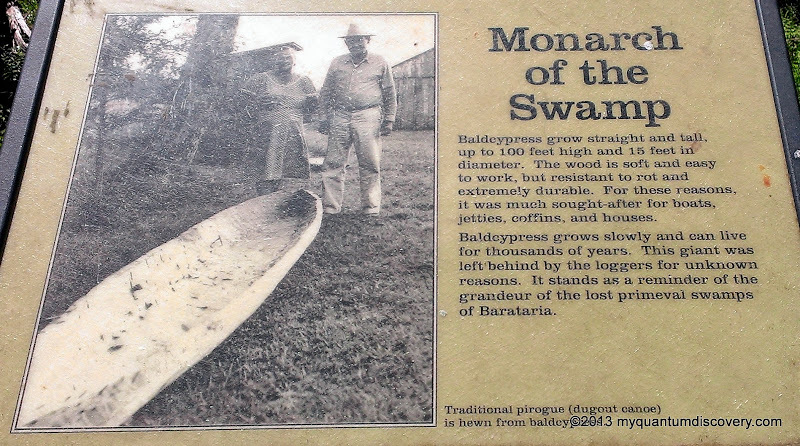 Records show that early French colonists named this swampy region “Barataria” which means “dishonesty at sea” after an episode in Cervantes’ “Don Quixote de la Mancha.” The 23,000 acre preserve includes bayous, marshes, swamps and forests where snake, alligators, nutrias (also known as river rats), over 200 species of birds and various other flora and fauna make their home. 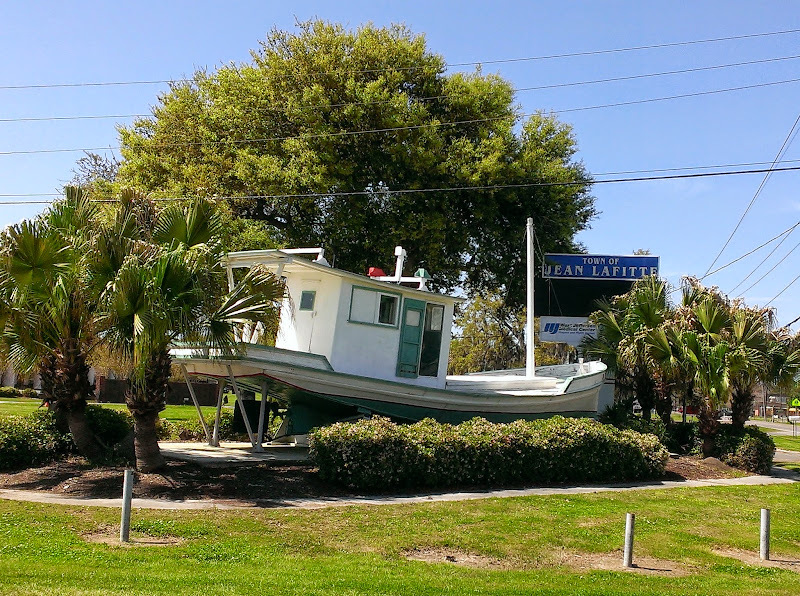 I remember hearing about Jean Lafitte especially when I was a kid, so I knew he was a pirate but I had no clue why there would be a park (as well as a nearby town) dedicated to him in Louisiana. An interesting article I found explains why – it said “At three separate times, U.S. presidents have condemned, exonerated and again condemned his actions. 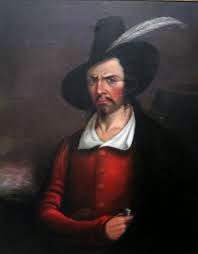 He is known for his piracy in the Gulf of Mexico, and lauded for his heroism in the Battle of New Orleans.” It was during this final battle of the War of 1812 that Andrew Jackson defeated the invading British army with the help of Jean Lafitte – the pirate quickly became a national hero. Stopping at the Visitor Center, we quickly learned that it is closed on Mondays and Tuesdays but at least inside the entrance to the building, they had trail maps available and we learned that we could listen to an audio tour on our cell phone by dialing 504-799-0802 and putting in the stop number (1 to 7) at designated stopping points. 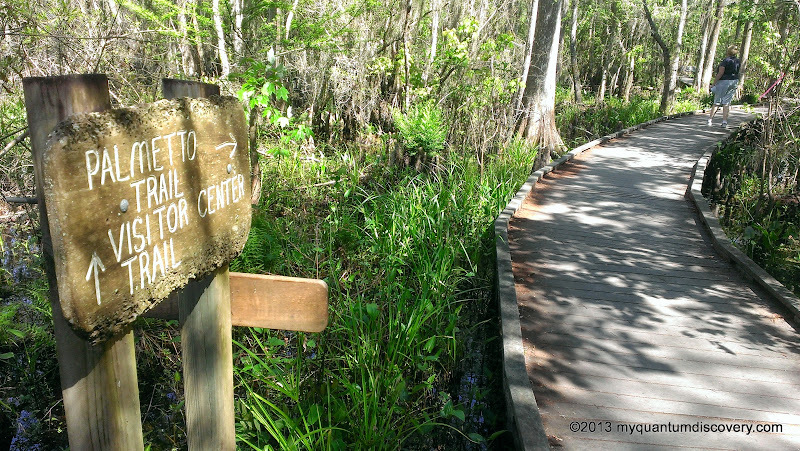 From the Visit or Center we began our walk along the Visitor Center Trail, then turned on to the Palmetto Trail (.9 miles one way) boardwalk where we initially passed through swamps with slow growing bald cypress trees that are thousands of years old and hundreds of feet tall and surrounded by “knees”. 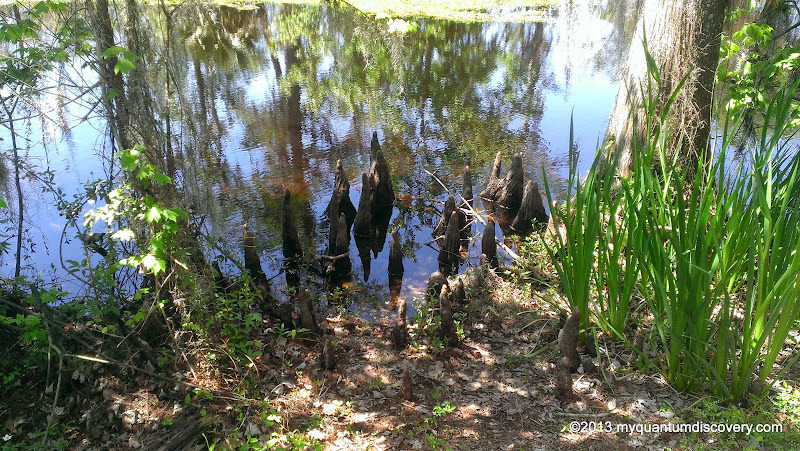 The “knees” are knobby segments of the cypress tree’s roots that protrude through the water and allow the tree to access oxygen. 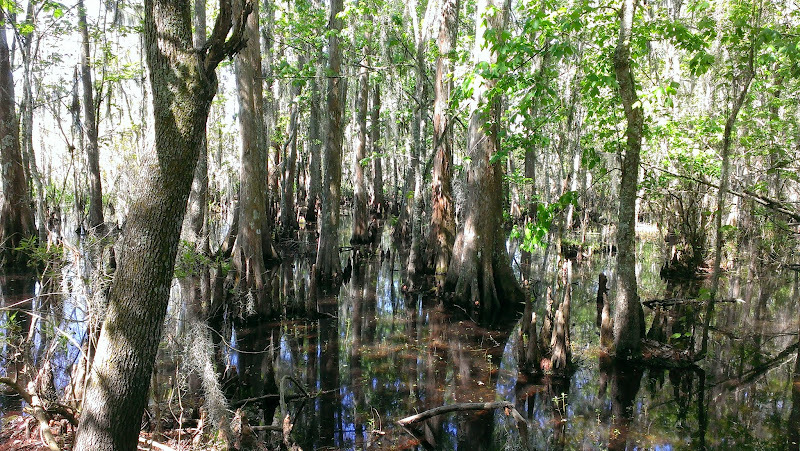 The bald cypress is one of the few trees species that host Spanish moss, creating an eerie and somewhat spooky atmosphere even on bright, sunny days. 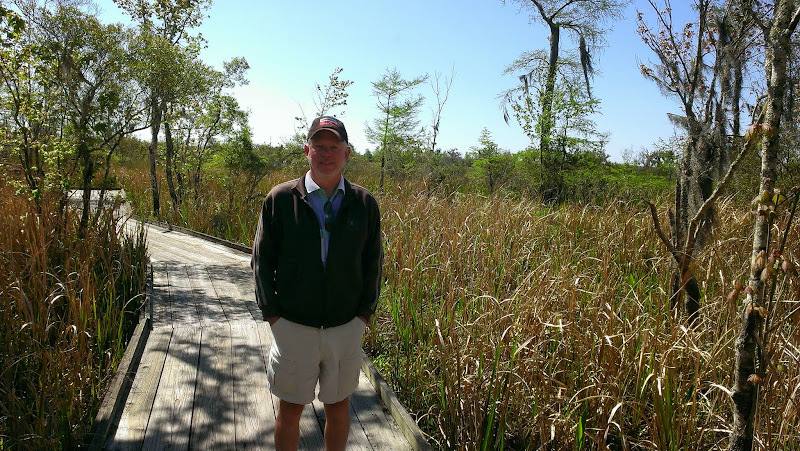 After walking along the boardwalk for a bit, the scenery changed – instead of the tall cypress trees we were now surrounded by a wide expanse of open marsh. 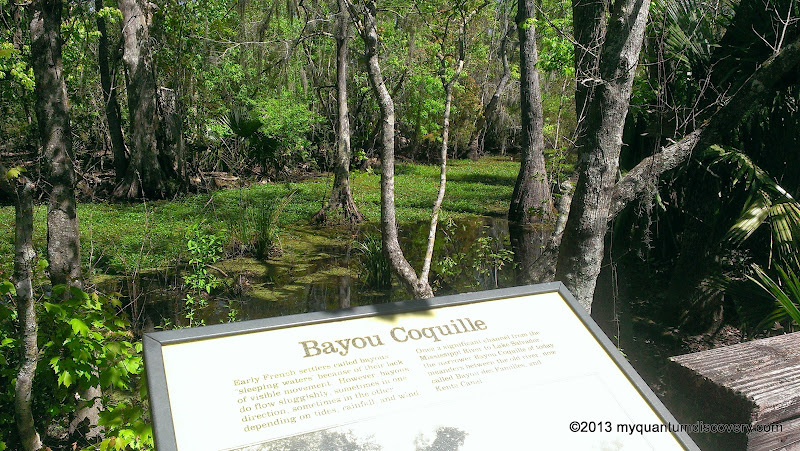 And then just as suddenly as we went from the swamp to the marsh, we were surrounded by live oak trees and groves of palmettos. We didn’t see a lot of wildlife except for an occasional anoli or other type of lizard basking in the sun but we could hear a lot of birds and a hooting owl. 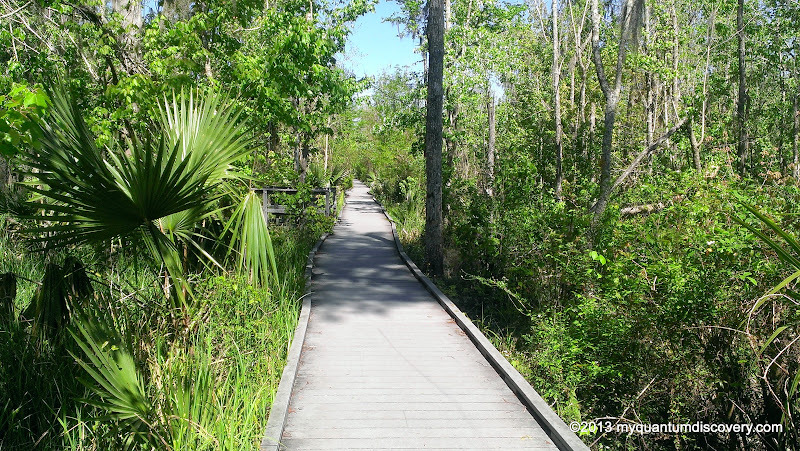 Blooming wildflowers bordering the boardwalk added a colorful touch to the solid green coloration of the palmettos. 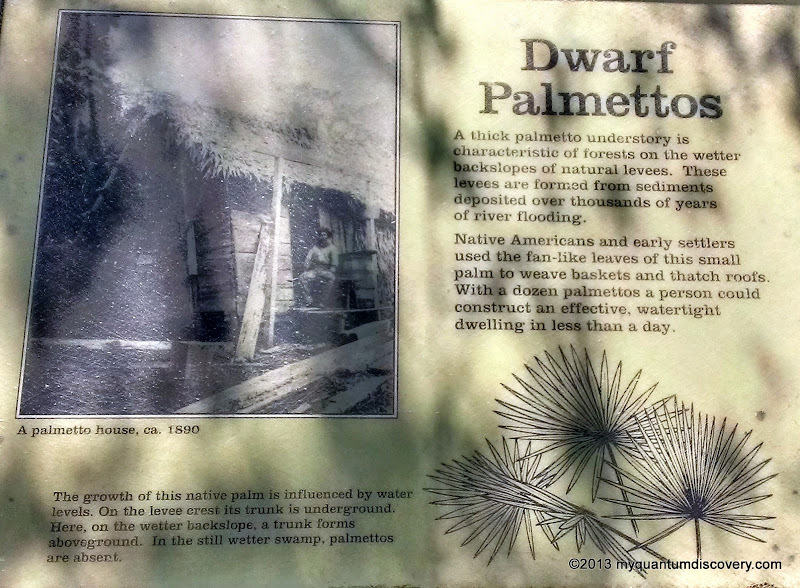 We were a little disappointed because we read that the park is known for their spectacular display of 4′ to 6′ tall giant blue irises – we could see the stalks everywhere but due to the recent chilly weather they would not bloom until after our visit. Darn! Must be totally awesome to see! Although I did read that there aren’t as many irises as there used to be as a result of Hurricanes Lili, Katrina and Rita which destroyed many of the plants and opened the shade canopy due to the destruction of many of the trees. 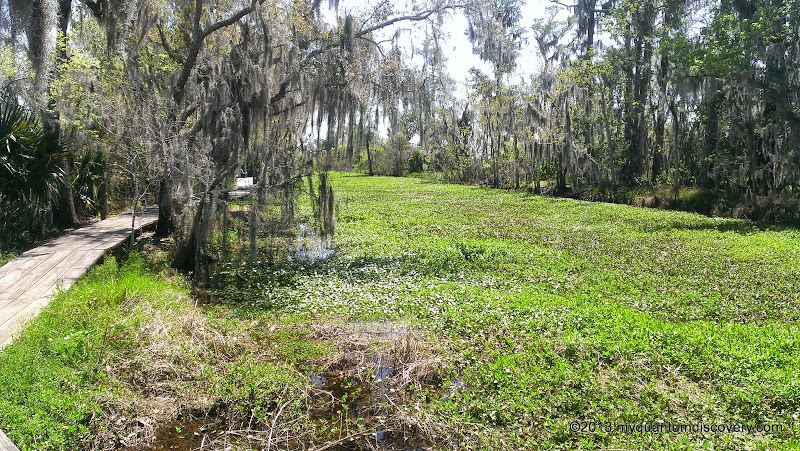 Because of the lack of shade, some of the other plants such as the water hyacinth have become so abundant they have played havoc with the ecology. 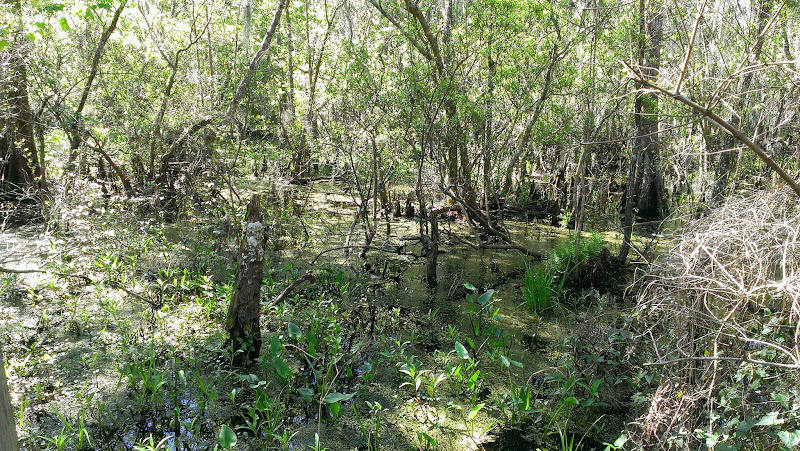 In addition the hurricanes filled the preserve with brackish water which the irises do not like. Whether the iris population will ever return to what it once was cannot be predicted. 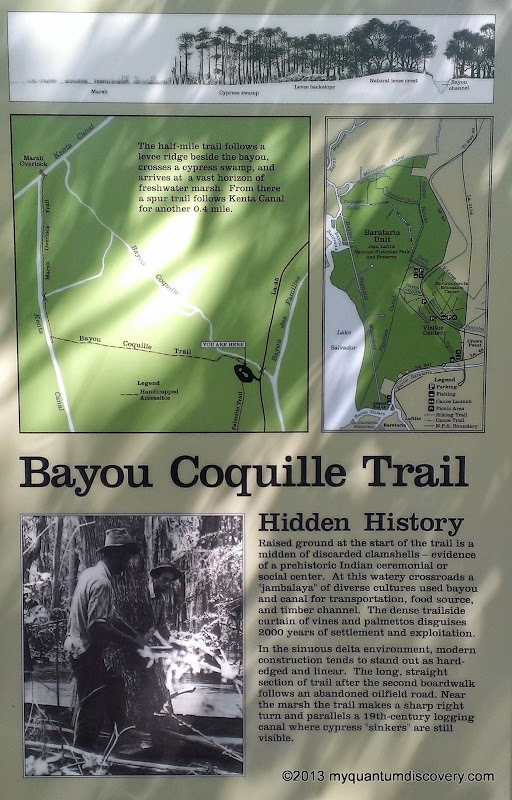 After walking about a mile, we finally came to a parking lot where we picked up the Bayou Coquille Trail (.5 miles one way). 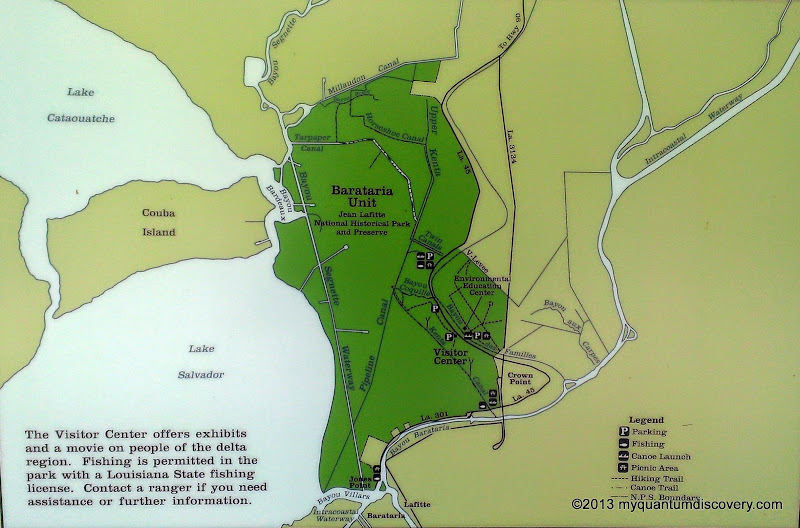 Once again we were surrounded by huge live oak trees some of which according to the audio tour were at least 250 years old! 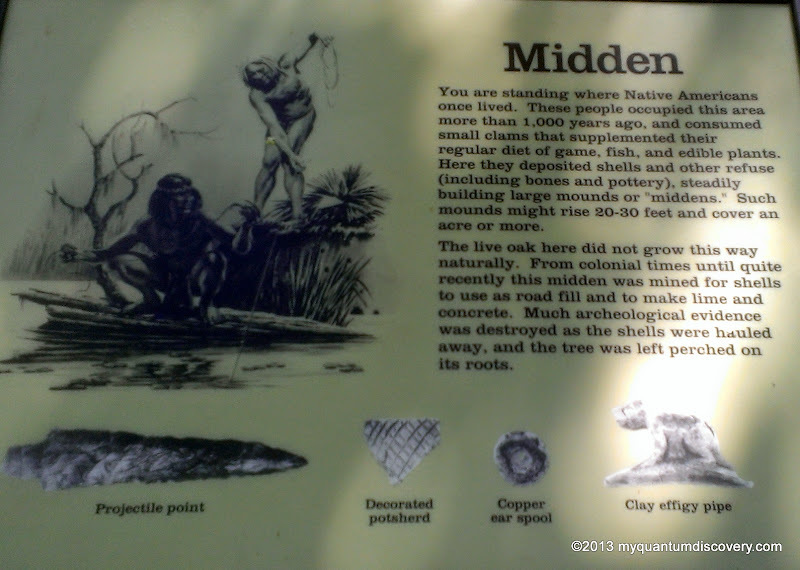 Live oaks do not like to grow in swamps, they like the drier and more elevated conditions found here in the “middens”, large mounds created from the shells and other refuse disposed of by Native Americans thousands of years ago. 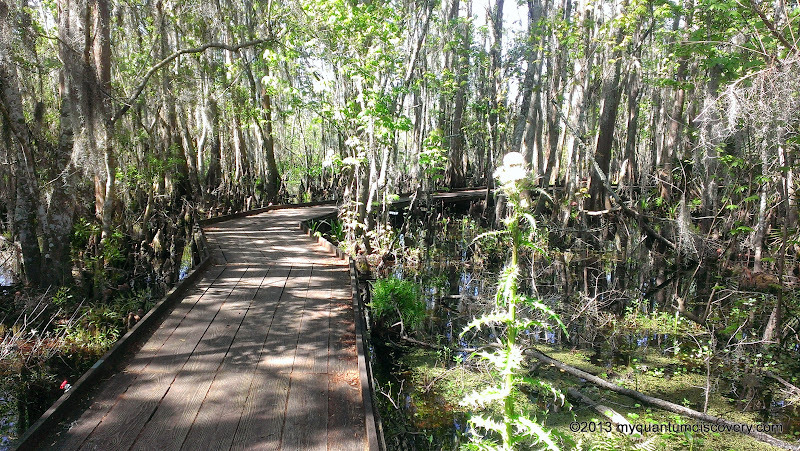 Because the wood of the live oak is so dense and so hard, it was once used to build ships. One particularly well known ship, the Constitution, got its nickname “Old Ironsides” because the British cannon balls bounced off the [live] oak planks on her side. 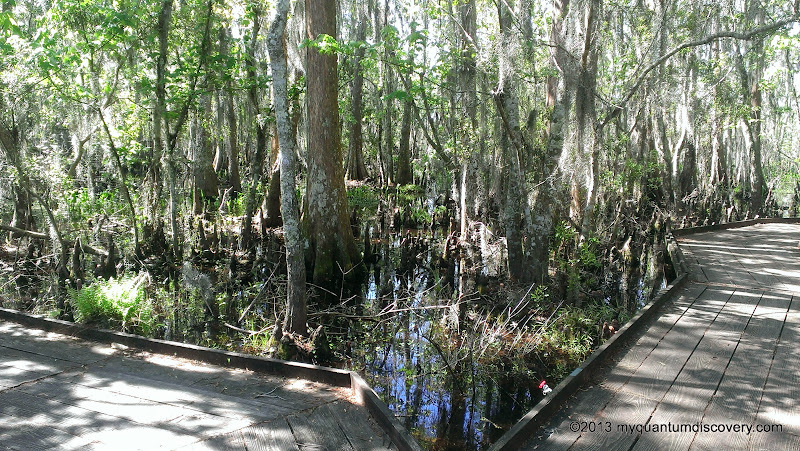 As we walked, the terrain changed again – we were back in the swamps once again surrounded by bald cypress trees and alligators, lots of alligators. 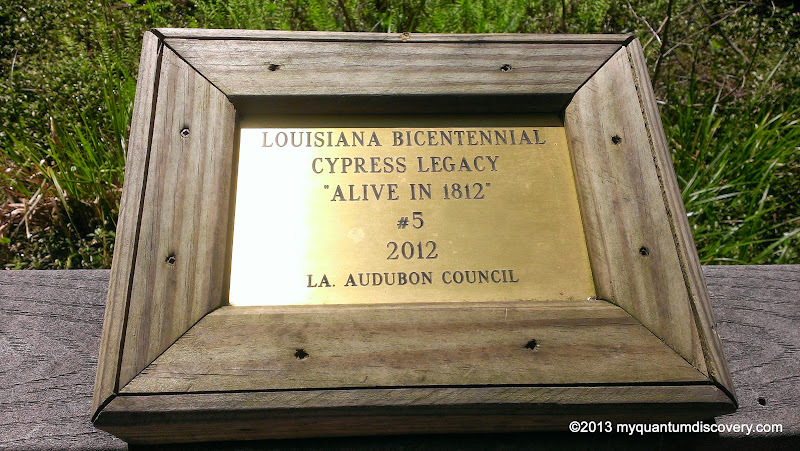 At one of the stops along the way, we were looking at one of the cypress trees and listening to the audio tour when we heard a loud splash. Yikes, what was that? 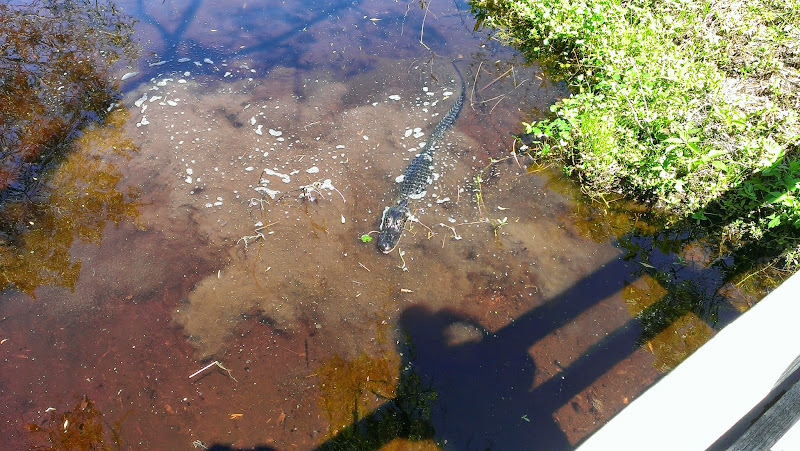 Across the boardwalk, an alligator, probably about 5 feet in length, had attacked something and was having his lunch! 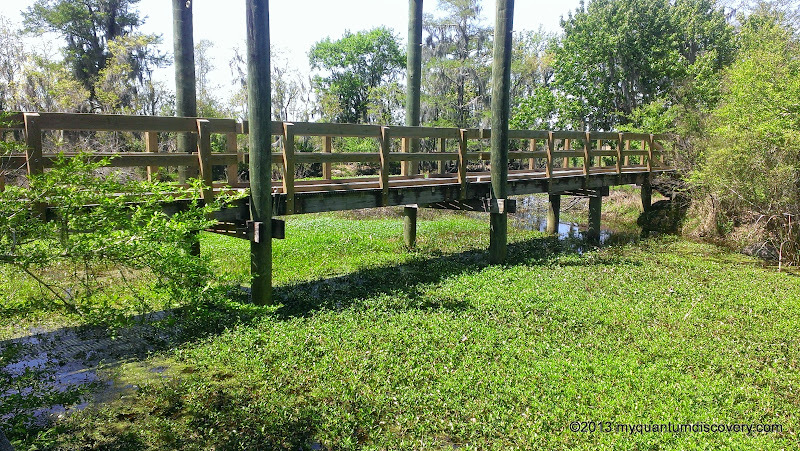 Eventually we came to a turn in the boardwalk as it changed course and became the Marsh Overlook Trail (.4 mile one way) which followed along the Kenta Canal. 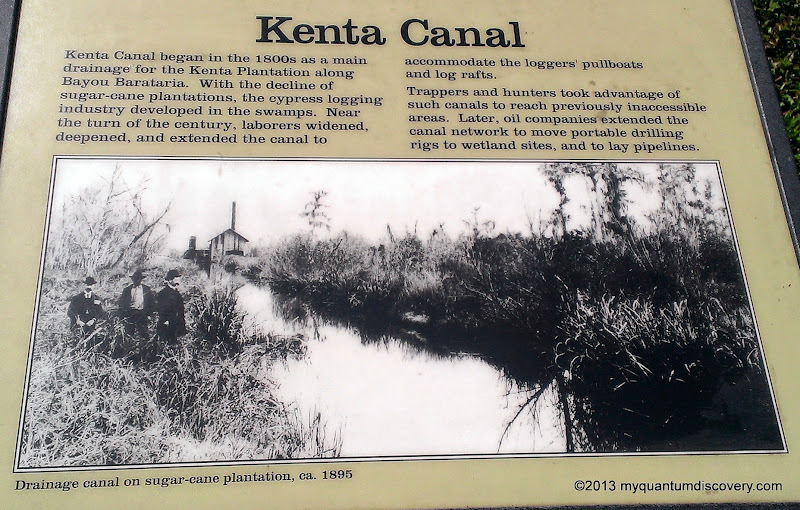 This canal began in the 1880’s was initially the main drainage for the Kenta Plantation along Bayou Barataria, but over the years it was later widened, deepened and extended to accommodate the logging industry and later the oil companies. 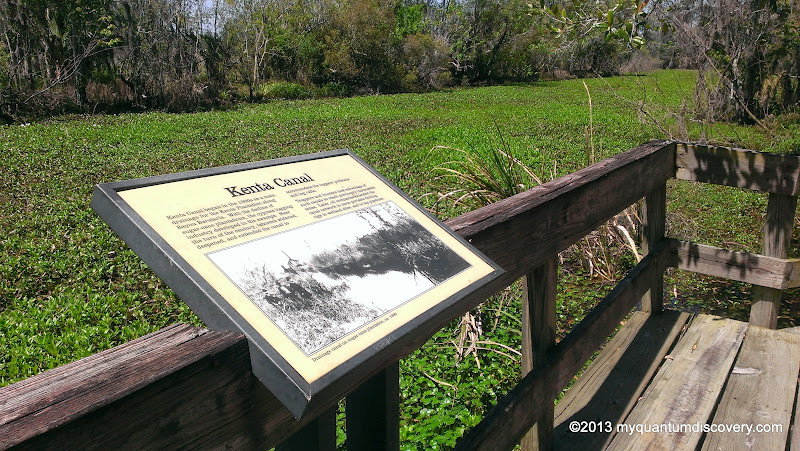 Across the canal we could see another very large gator swimming along and then climbing the embankment. Check out this video! You can hear the audio tour playing at the beginning of the video. Listening to the audio tour, we learned that alligators grow up to 1 foot per year until they reach 5 years old, then their growth slows. 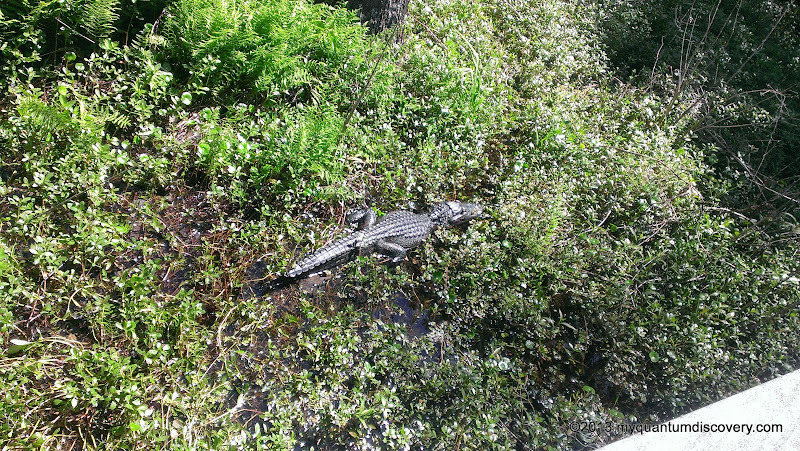 Although a male alligator can reach up to 15 feet long, the average length in the preserve is about 13 feet long and that despite their size, they can move very quickly when they want. So beware! 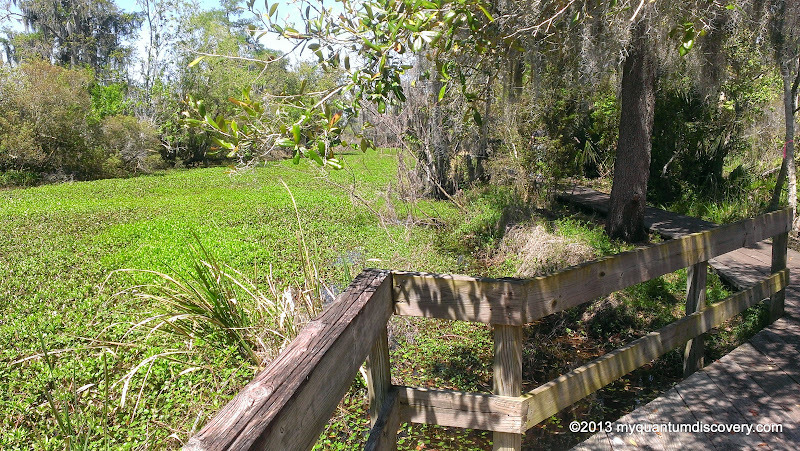 Walking along the canal towards the final overlook, the boardwalk had changed – it was no longer elevated but was only a few inches above the swamp, only about 3 1/2 feet wide and didn’t seem to be in as good a condition as the earlier sections. 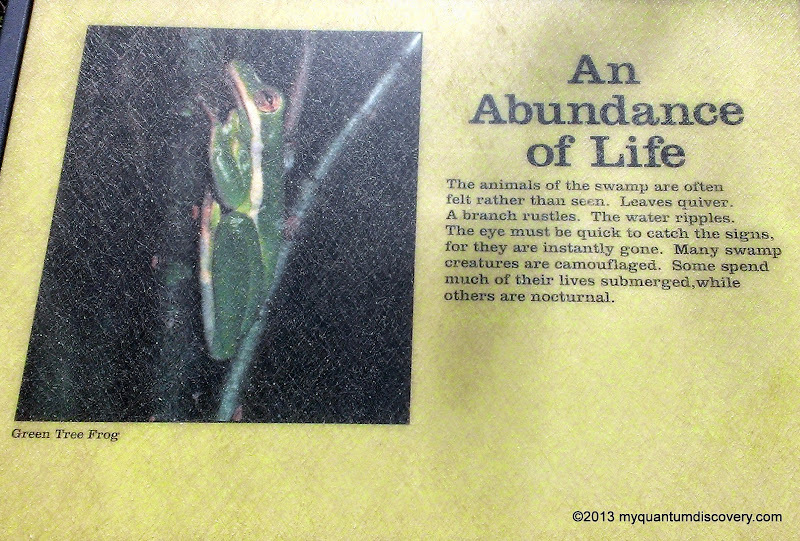 I must have had a premonition because I kept thinking how awful it would be to fall and perhaps end up in the swamp. 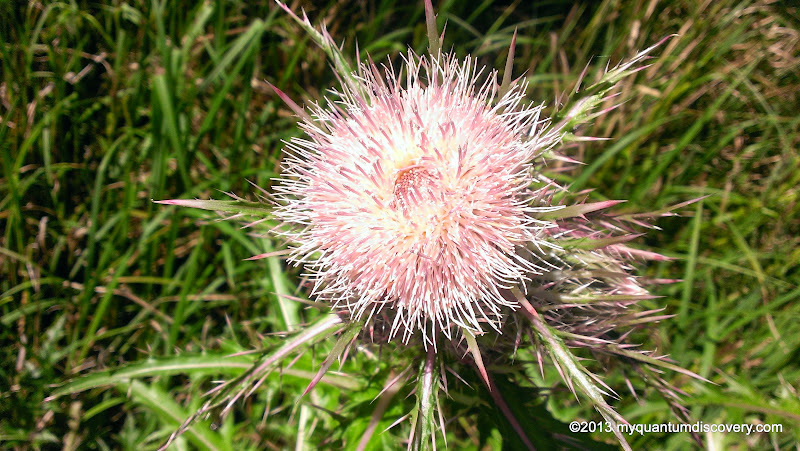 I’ve been known to not always stay on my feet, in fact about 10 years ago, we were walking along a sidewalk in Newport, RI when I tripped on a tree root protruding out of the sidewalk and fell breaking two fingers on my left hand. And then there’s the time when I fell…hmmm, maybe I’ll just leave the rest unsaid. Since then, Rob is always telling me to watch where I am going. I’m sure you can see where this is headed, right? Well, I guess he neglected to say that to me (does this mean I can blame him for my being such a klutz?) because two slightly warped pieces of wood were sticking up and I, being enthralled with everything else around me except where my feet were landing, didn’t see them – my right foot hit one edge, my ankle twisted, and with a noisy THUD down I went, narrowly missing going into the drink! Hmmm, I wonder if the noise scared the gators? Or maybe they headed in our direction thinking their lunch order had arrived! 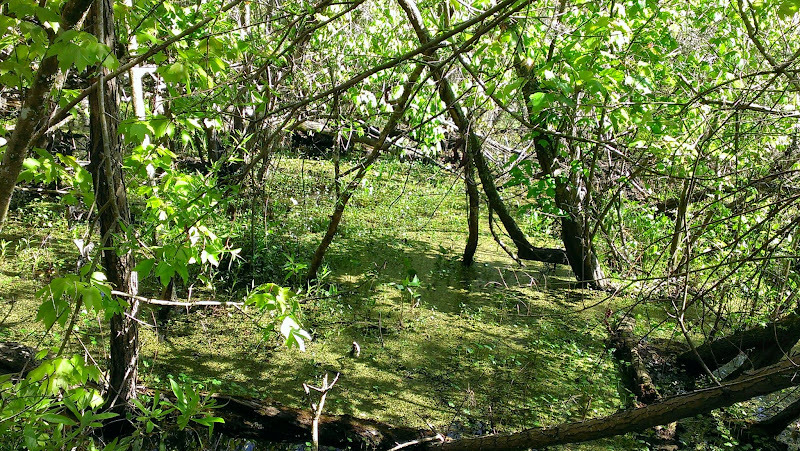 In the split seconds as I fell, I thought oh no, no, no, no, please, please, please don’t let me land in the yucky swamp water! But thankfully luck was with me (well, the luck part is probably questionable – if I was lucky I wouldn’t have fallen in the first place) and there I was in a heap, lying face down, sprawled across the boardwalk. Jeesh! With a badly scraped right knee and right forearm, feeling totally stupid and like a total klutz, I managed to get back on my feet and continued to limp onward. Fortunately, there was no one else around except Rob (and he’s already seen me at my worst) to see me fall flat on my face – how embarrassing that would have been! After checking to make sure I hadn’t broken anything, Rob commented that he wished he had had the camera ready. Hmmm, maybe we could have made $10,000 on America’s Funniest Home Videos! Guess that would have made it worthwhile! 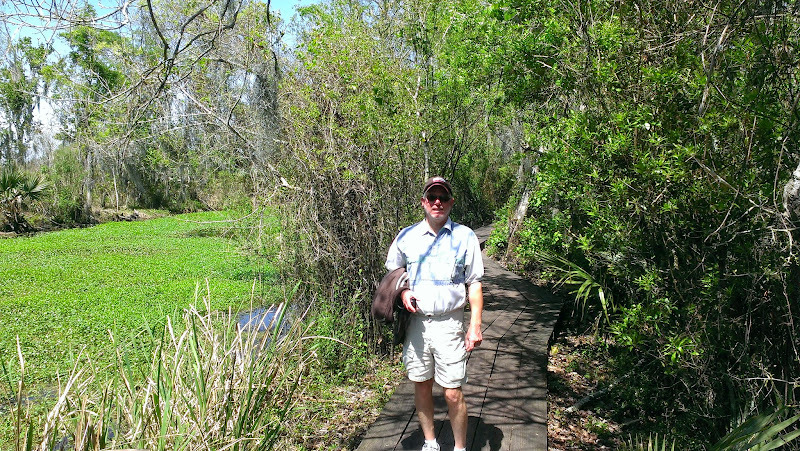 After a short distance, we crossed over a bridge to another overlook which was the final stop on the boardwalk. 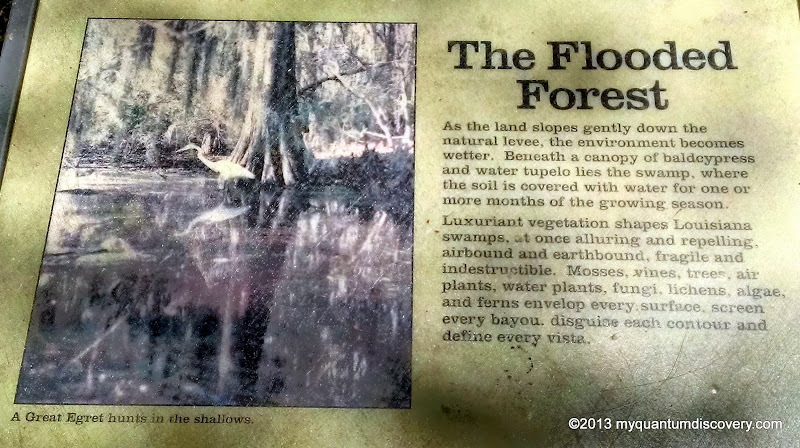 Ahead of us was a fresh water marsh known as a flotant (pronounced flo-TAHNT) which is composed of thick, floating mats of vegetation not attached to anything with open water beneath. 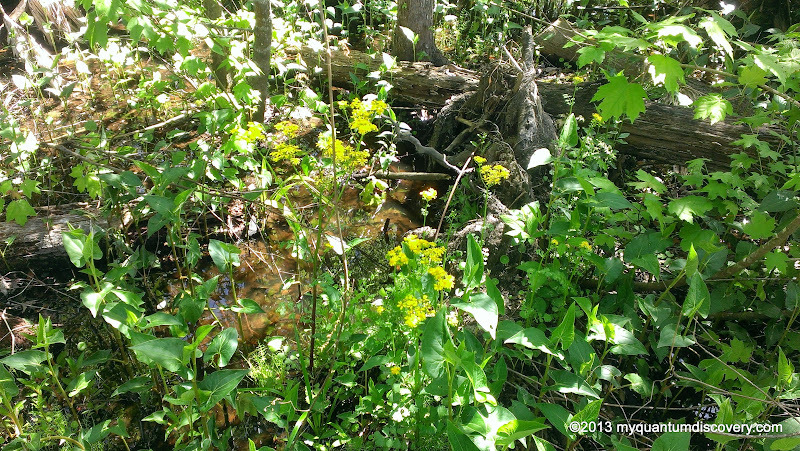 Pretty deceiving – it looked like solid ground. The voice on the audio said that this was not a good place for humans to take a walk! No kidding! After taking a rest and giving me a short time to recover emotionally and physically from my very minor injuries, we started on our way back, knowing that we had at least a 2 mile walk ahead of us. Do I need to tell you how many times Rob told me to watch my step on the way back? Probably not! 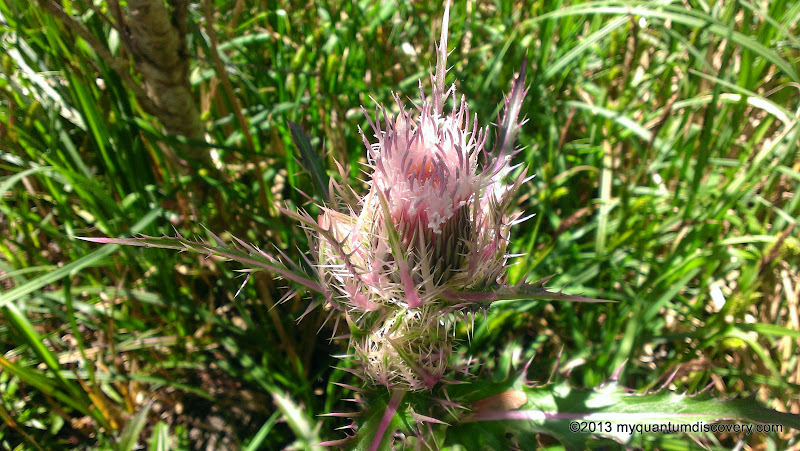 He didn’t really need to – I had learned my lesson the hard way! Trust me, I wanted to make sure that I stayed upright all the way back so my head was down looking at my feet the entire way – my scenery was the boards on the boardwalk and my two feet! In fact I never saw the snake in the photo on the left! 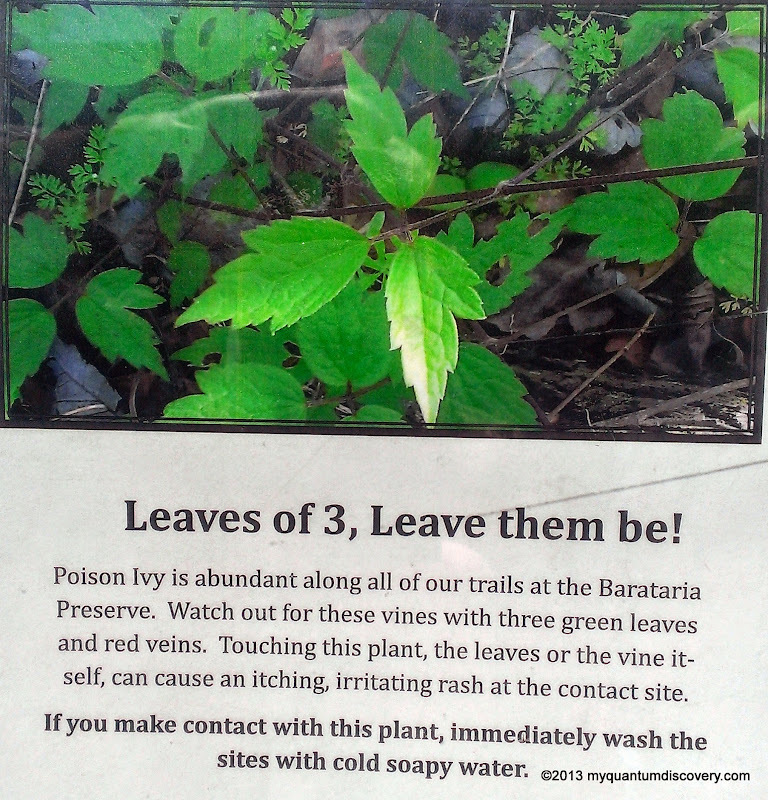 Eew! Good thing! Not fond of snakes at all! And this guy was not to happy to be disturbed and began shaking his tail at us. We moved quickly past! We finally arrived at the car where Rob got out the first aid kit so we could clean my wounds (ouch) and then head back to the hacienda where we spent a quiet evening. 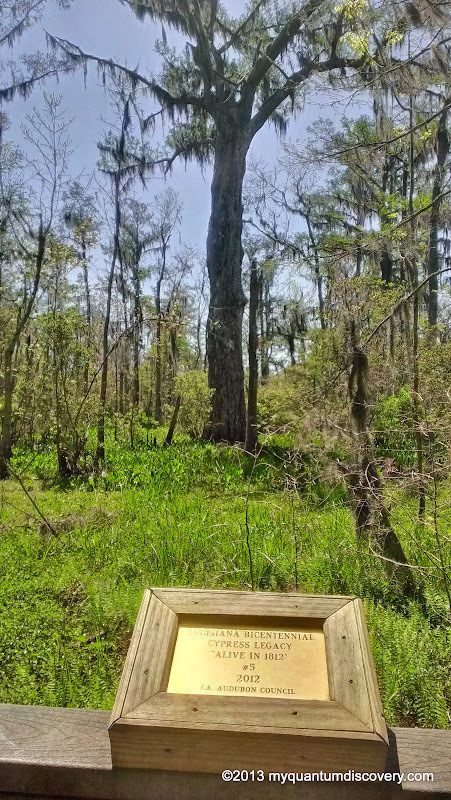 Who would have known that this beautiful piece of nature existed just a short distance from the thriving city of New Orleans! 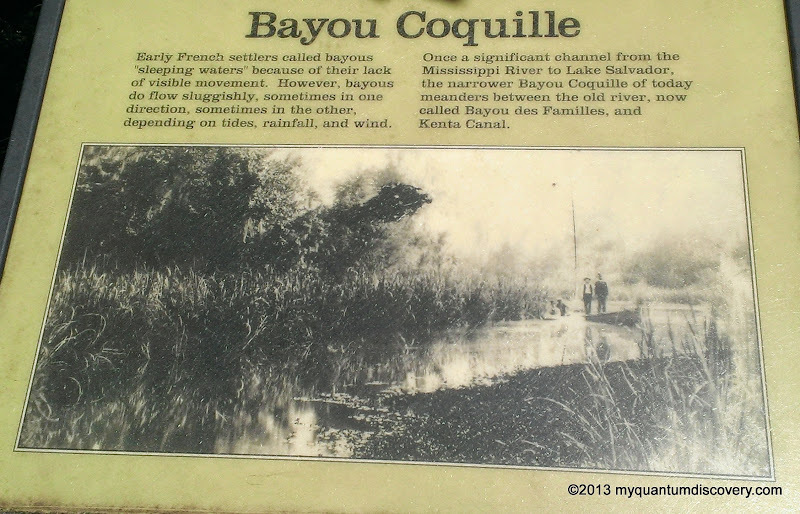 If you are ever in the New Orleans area, a visit to this park is an absolute must! 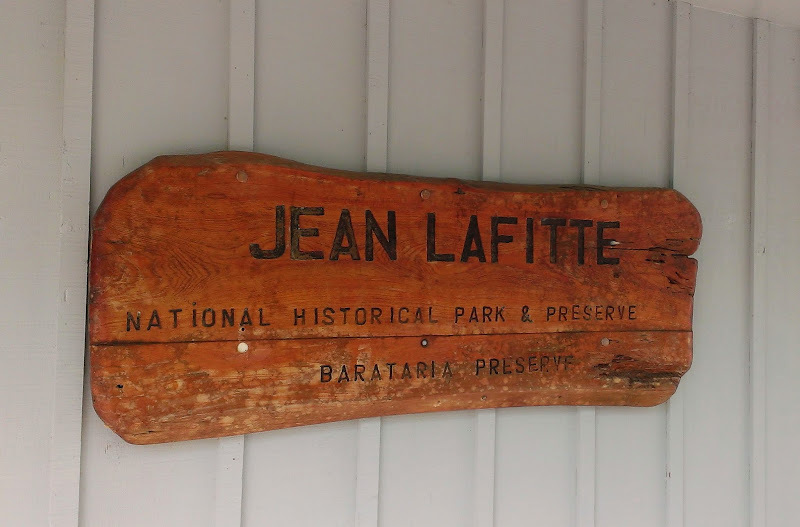 As mentioned at the beginning of this post, there are a total of five other sites that make up the Jean Lafitte Nat’l Park which we didn’t have time to explore, but you can be sure that they have been added to our bucket list. 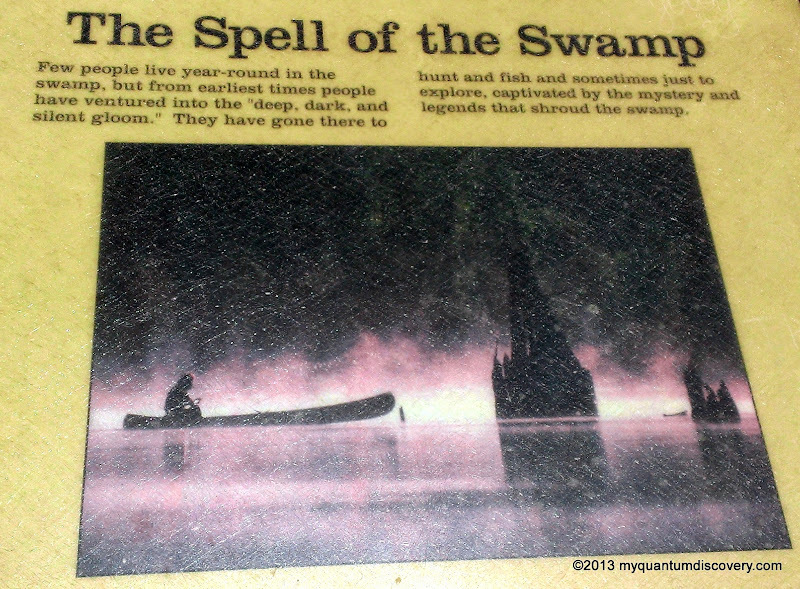 Our day had ended but our adventures in the swamp weren’t over yet, stay tuned to learn what we did the next day! Your very descriptive nature lesson was fantastic. The anoli was a beauty and it didn’t scare me. However the other big guy would have put me in a panic mode. The alligator video was spectacular. Nice job. Turtle reminded me of the sea turtles at the Turtle Hospital in Marathon Key. Hope you are healed from your fall.